Published: Jan. 9, 2014 at 01:05 p.m. Updated: Jan. 9, 2014 at 07:41 p.m. The Washington Redskins have their coach. The Minnesota Vikings might not be far behind. 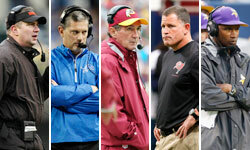 NFL Media Insider Ian Rapoport reported Thursday that a trio of candidates are believed to be finalists for the chance to replace the fired Leslie Frazier. Cincinnati Bengals defensive coordinator Mike Zimmer and Todd Bowles, who runs the Arizona Cardinals' defense, are two of the three, Rapoport was told. The third candidate remains a mystery. A nugget on the Bowles front: If he wins the job, Rapoport cited former Dallas Cowboys and Buffalo Bills coach Chan Gailey and Baltimore Ravens coordinator Rick Neuheisel as possible hires for offensive play-calling duties. The Vikings planned all along to interview up to 10 candidates before whittling the field down to three. Plans to meet with Jay Gruden were erased after the former Bengals offensive coordinator hammered out a deal Thursday to become coach of the WashingtonRedskins. On the heels of the Frazier era, Minnesota again appears poised to hand the reins to a proven defensive-minded coach. Zimmer -- an entertaining wild card on last year's "Hard Knocks" -- would be an intriguing hire. But whoever takes over in Minnesota can't ignore an offense with major issues at the quarterback position -- a bee's nest of non-viable passers who played a major role in Frazier's fall from grace.